There is something about my childhood and s’mores that makes me smile. Although it is getting warmer outside, we have not started having open fires to make traditional s’mores. These s’mores pudding cups have all the same flavors of a s’mores cooked over a camp fire, but the ease of doing it in the fridge. Plus you need to make this dessert ahead of time so it is great for serving at a party. 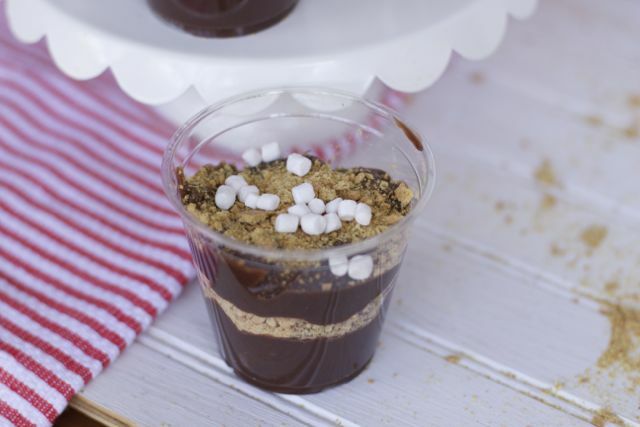 Kids will go crazy over their cups of chocolate, graham cracker crumbs and mini marshmallows. Make them in plastic cups and you have little clean up too. 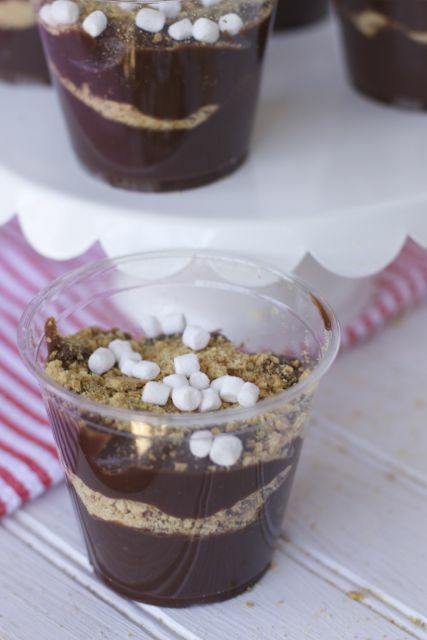 So what are you waiting for, surprise you kids and adults with this super easy s’mores pudding cups dessert. These make a great dessert to compliment a BBQ party too. 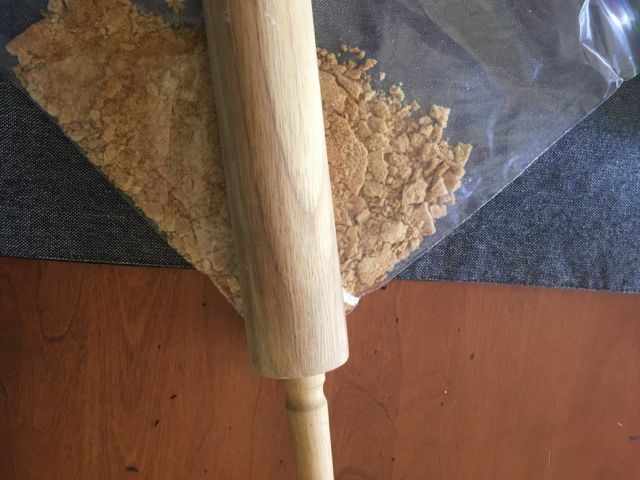 If you don’t have graham cracker crumbs in the box, make them yourself. They will probably be fresher than the opened box in the back of your pantry. 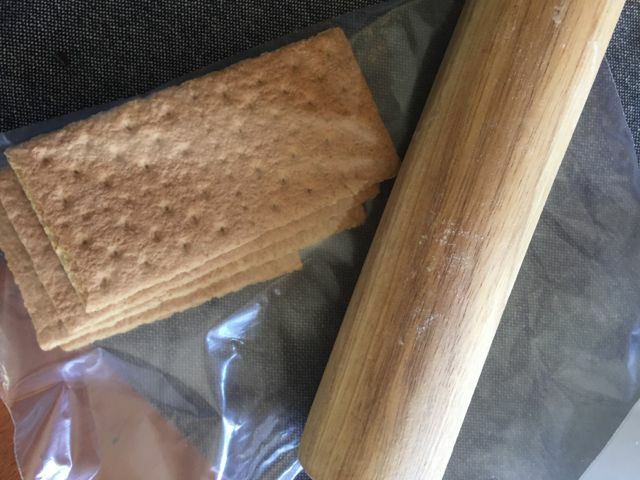 Place some whole graham crackers into a ziplock bag, seal shut and using a rolling pin crush the crackers. This is fun for the kids to do too. I used chocolate pudding and prepared it per the directions. 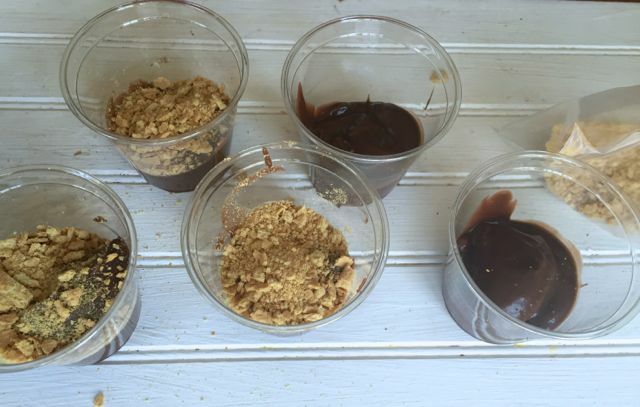 Then simply layer chocolate pudding, graham cracker crumbs, pudding in small glasses. Top each cup with a few mini marshmallows. I am talking about the uber small ones. Place them in the fridge for at least 30 minutes to set completely and get cold. What would your BBQ guests think if you brought out a tray of these? These are super easy and the kids will love them. I must confess I had one as well. I love the sweetness of the pudding and the crunchy crumbs of the graham crackers. I don’t have a recipe for this per se but you get the idea. I used the larger box of pudding and was able to make 5 pudding cups. I also like the clear cups as you can see the great layering of the ingredients. 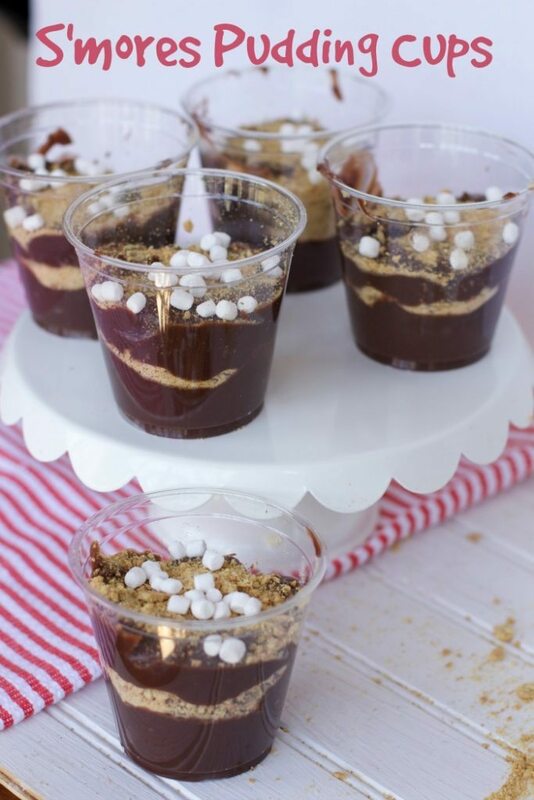 What would you add to these s’mores pudding cups to make them extra special for your family and BBQ guests? I LOVE s’mores. Rarely do I get the chance for traditional ones over a bonfire, but I eat up anything with s’mores flavor that I can get my hands on! Yum! This looks delicious! Saving to make this later! This really hits the spot for me – I absolutely love s’mores and am always looking for great ways to enjoy that flavor combo in the winter when it’s just not feasible to gather around the campfire! Thanks for sharing this recipe – even in the summertime I feel like it would make for a great prep-ahead dessert for company!